One hundred and one years ago, Einstein published his general theory of relativity. He posited that light bends under the influence of gravity. One of the coolest manifestations of Einstein’s general theory of relativity is the existence of Einstein Rings. Einstein rings are formed when a massive object (such as an elliptical galaxy, a galaxy cluster, or even the Sun) bends the light from a background object around itself, magnifying but distorting the image of the more distant object. This phenomena is called gravitation lensing, as the gravity of the foreground object, or lens, is amplifying the signal from the background. An Einstein ring forms when the geometry of the system is just right, so that the background object is directly behind the one in front, thereby spreading the signal from it equally in all directions. Figure 1 shows how the system must be arranged to get a perfect ring of light around the foreground mass. In today’s paper, the authors present a newly discovered Einstein ring in the constellation of Sculptor in the Southern Hemisphere. This ring was found serendipitously using the Dark Energy Camera. The ring is almost complete, subtending approximately 300°. Images of the ring are shown in Figure 2. Two very distinct colors can be identified, with the central galaxy being very red while the ring is quite blue. Besides the ring’s distinct shape, the existence of two colors is another clue that the image is comprised of two separate objects. 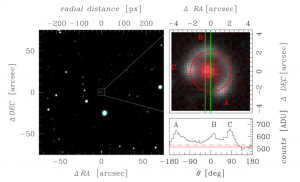 The authors followed up the images by doing spectroscopy of the galaxies to find the distance of each object by looking for specific emission lines or spectral features that would indicate each object’s redshift. By fitting model templates to the spectra from the central region and the ring, the authors found that the lensing galaxy is an elliptical, or S0, galaxy with a redshift of z = 0.581. The ring is the distorted image of a rapidly star-forming (or starbursting) galaxy with a redshift of z = 1.165. Figure 2: The Einstein ring discovered in the Sculptor constellation. Einstein rings provide an excellent way to “measure” the mass of the lensing object because it is dependent only on knowing the angular size of the ring, the distance from us to the lens and the distance from us to the background galaxy. The authors determined the mass of the foreground massive galaxy to be 1.86 x 1012 solar masses. That is ten times the mass of our own Milky Way Galaxy! As large surveys become more common, more Einstein ring configurations will be found, allowing us to see more distant objects that would otherwise be unobservable. I am a postdoctoral researcher at the University of Louisville. I study galaxy evolution via emission lines of samples of galaxies that span the entirety of cosmic history. Outside of science, I love to read fiction and do karaoke, among other things! Follow me on Twitter at @bojibridge.